This past week I saw the Wilkinson Sword commercial advertising their new Quattro Bikini razor & I decided to see what it was all about. Thursday I went on the Wilkinson Sword website and found they were having an introductory sale at £7.99 plus you get free P&P if you spend over £10 so I added the Activ Gel to my order. This morning my order came..quite fast for free P&P and a late Thursday order. I love the inside packing lol, I love pink - yes I love pink. It looks quite 70s retro. I even got some sweeties ( how sweet ) travel bag and the supplied battery is attached on the back of the cardboard that the razor is attached to! 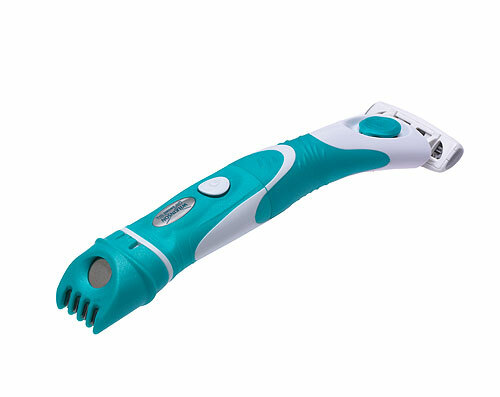 You twist the center of the razor to open up the battery compartment! You press the button on and let go...easy enough! On one end you have the trimmer. You remove the comb to clean the blades after every use. On the other end you have your 4 bladed razor. I'm going to be having fun trying this out lol, yes my days are getting to the point that I'm excited to use a new razor. All in all I had a good experience purchasing from Wilkinson Sword. When they send you the confirmation email they even send you a preview image of your order so you know what you're getting, pretty good huh!? - Original images deleted from Imageshack. I'm telling you grab a bargain while you can all you got to do is after buy a battery and refills - depending on how much you use it lol! But I love it already. Lala you so loopy sometimes but I lurves it! lmao! People must of thought something else when I kept tweeting about playing with a razor aha. But I love it, never felt so smooth =X aha.